Imagine you’re meeting a blind date at a coffee shop, a setup by your friend who just wouldn’t take no for an answer. Even though you’re not really interested in a relationship right now, you arrive only a few minutes late, and looking across the café, you see a guy jump to his feet, frantically waving his arms over his head, a little too eager to get your attention. Apparently, he recognizes you; obviously, he’s been studying pictures. Already, you’re suspicious of his motivations and thinking he looks a bit foolish. You’re busy conjuring up an excuse to get out of this date as you reach out to shake his hand, but he grabs you with both his hands and pulls you into a half-embrace, kissing both your cheeks, before you have a chance to react. Now you’re thinking this guy’s way over-the-top, clearly desperate to have a relationship and in serious need of a schooling on personal space. Anyone who’s that self-absorbed and disrespectful of personal boundaries, oblivious to body language clues and that desperate for a relationship, is clearly not someone you want to hang out with. But did you ever stop to think that’s what your horse might’ve thought, the first time he met you? 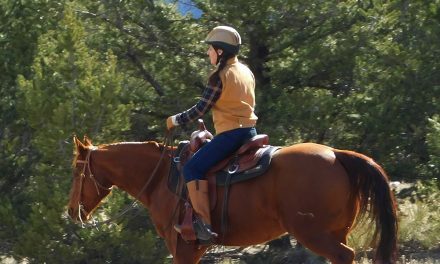 This is the story of Amy and Chief, the big bay Morgan, recently featured in episodes of Horse Master. 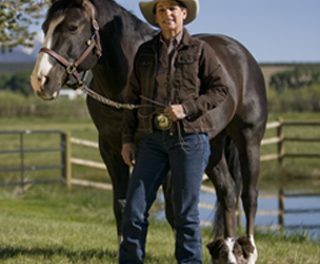 It took almost a year for Amy to come to the realization that she’d started her relationship with Chief on the wrong foot and that her dream horse had turned into an aggressive bully who was disdainful and resentful of her. Dream horse turned night mare. Long before actually being in a position to have a new horse, many horse-crazy people have spent years imagining the perfect horse and perusing dream horse ads online. Amy was no exception. Just like with movies and restaurants, when there’s a big a buildup and expectations are huge, it almost always leads to disappointment. As luck would have it, just when Amy was finally in a position to acquire a new horse, the local horse rescue posted pictures of her dream horse online—a big, beautiful, bay Morgan who’d had a rough life and was in desperate need of someone just like her—a strong and confident rider who would shower the horse with love. Before even seeing this horse in the flesh, she’d already made the decision that they were perfect for each other. 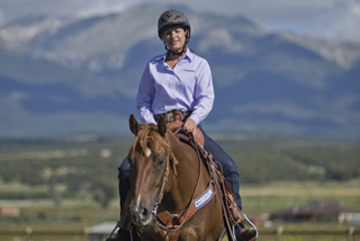 Pulling up to the rescue to “test ride” her new dream horse, Amy was literally glowing with anticipation, knowing full well she’d already made up her mind and there was nothing he could do to disappoint her. Gushing about his beauty as she approached him for the first time, pulling a baggie of freshly sliced apples and carrots from her pocket, she stepped right into the horse’s space, fawning and petting him, kissing him on the nose and stuffing treats in his mouth. Tears of joy were running down her cheeks; she was falling desperately in love with this horse she’d only just met. Sound familiar? 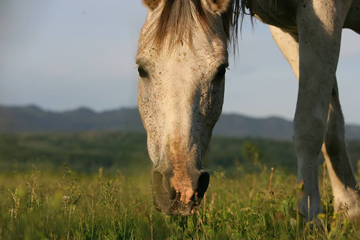 Now let’s consider what it’s like from the horse’s point of view, when a horse, like Chief, is looking for a new herd. For whatever reason he finds himself alone, his instincts tell him survival is dependent on being accepted into a herd, so he sheepishly approaches the herd, asking for acceptance. The existing herd wants nothing to do with the new horse, so they start biting, kicking and chasing him away. The herd leaders will be quite aggressive to the new horse, driving him away, herding him in one direction then the other, to establish control of the new horse. He runs away, but always comes back, lowering his head with a contrite gesture, adopting a submissive posture, seeking out approval and acceptance. Eventually, if he plays his cards right, the herd leaders will allow the new horse probational membership into the herd. But he will remain on his best behavior, hoping to stay in good graces with herd leaders. Horses always seek acceptance into the herd; they respect and admire the leader of the herd and want to be with her. Herd leaders don’t beg for members or bribe and coddle a new horse so he’ll want to be in their herd. A strong and competent leader is what makes a herd great and what makes the other horses want to be part of it. A good leader does not have to beg for followers. 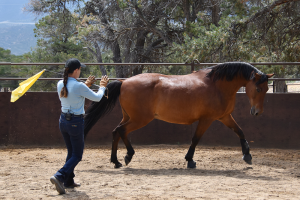 Horses establish dominance and control first, then work on the finer points of a relationship later. Amy started her relationship with Chief by showering him with love, telling him he could do no wrong and begging him to be part of her herd. To Chief, anyone that desperate for a herd mate couldn’t possibly be a good leader or have anything of value to offer him. Chief did eventually come home with Amy to his forever home, but the story was far from over. Things went well at first, but in time, Amy’s attempts at groundwork with Chief started annoying him (“Who does she think she is?”), and he felt the need to assert his dominance over her, to put her in her place, by displaying aggressive gestures. His antics worked, thoroughly intimidating Amy, and nearly a year into this relationship, it was starting to resemble a bad marriage. For myself, I never want to start a relationship with a horse with bribery or pampering. In fact, those things are never a part of any relationship I want with a horse. I want the horse to recognize my leadership from the very beginning and for him to want to be with me, in my herd, to beg for my acceptance and approval. I usually start a new relationship with a horse in a very authoritative and standoffish way, looking for opportunities to move him out of my space and communicate my expectations to him. I’d like him to think I have no interest in him; I prefer to let him come to me. I was impressed that Amy came to the understanding of the bad dynamics of their relationship on her own, of how she got off on the wrong track with Chief from the beginning. The analogy of a guy proposing marriage on a first date was actually Amy’s idea. She knew she made some major mistakes from the beginning of their relationship, but she did not think it could be fixed. She was beginning to wonder if she was the right human for this horse after all. The good news about horses is that once the person changes, the horse always changes with them. Once Amy understood what had led them to the predicament they were currently in, she was able to change how she acted. We started by taking Chief back to the round pen, to mimic the antics that go on when a new horse asks for acceptance into a herd. It wasn’t easy. It was scary at times because Chief was intolerant of her mistakes and stayed dominant and aggressive for a while. It took a lot of courage, patience and determination—qualities that Amy fortunately has an abundance of– for her to stand up to Chief’s bullying and stay strong. Amy still has a lot of work to do with Chief, to get their relationship back to the dream horse category, but as she changes her approach and her attitude, Chief changes right along with her. Now, a few months into the cold-shoulder routine and in combination with the disciplined ground work she’s doing, to Chief, Amy is starting to look like a leader that he wants to be with. Even though we may only have one chance for a first impression, and we never want to squander it, this story is proof that by understanding another’s perspective and reflecting on how our own actions are perceived, it can lead to a positive change. That kind of introspection and accountability is not always easy, but Amy rose to the challenge and Chief responded in-kind.